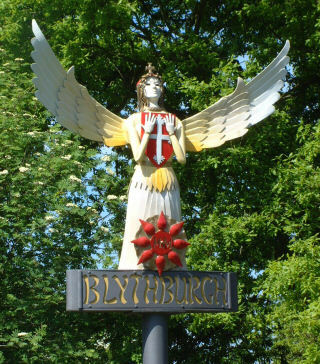 Early in 1999, with the Millennium fast approaching, Blythburgh, in common with many other villages, was considering how best to commemorate it and what permanent reminder might be appropriate. In the summer of 2000 an idea became reality. The Angel of the East, as some people had begun to call it, had arrived. How it came to be here affords a unique glimpse into the mind and the world of an artist working in metal. Villagers were asked to submit designs and Ray and Joan Sinclair-Brown's idea and design were chosen. Mrs Henrietta Maslen, then Chairman of the Parish Council, told me of the deliberations about choosing the artist to make the sign. "Eventually we chose a Suffolk artist, Graham Chaplin, to make it. He is an artist in metal with a forge at Buxhall near Stowmarket. He came to look at the site, Knoll Green, at the eastern end of the parish church, the only site owned by the parish council. A few weeks later he phoned to say that he had made the head but that the body, to be in proportion, would be about four feet high, much bigger than we had anticipated or visualised." The day came when it was completed and ready to be seen in its uncoloured state. Mrs Maslen, Ray Sinclair-Brown (one of the two designers) and myself went over to the forge. There is a phrase somewhere, and classicists will know it, where the poet Petrarch sees Laura, his future muse for the first time: "Sa beaute le frappa." And so we were: hit between the eyes through the windscreen, even before getting out of the car. At this point Mrs Maslen asked me to stop the tape. That moment is still overwhelming for us and "Iron Angel, Blythburgh", the poem, gives you an idea of its power even in its uncoloured state. Graham Chaplin agreed to answer some questions about the gestation, the difficulties in making the angel, and what his first thoughts were on being approached by Blythburgh Parish Council. His first thoughts were "of excitement, to give me a chance to prove what real wings and elegance should be like. I wanted real beaten lines in every feather and to show the wonderful folds in the garments, like a Greek goddess." His researches took in Greek and Roman clothing, and feathers in particular, and the paintings of Icarus, Diana and Endymion in various galleries "for the wonderful wing work". To be allowed inside the head of an artist, as it were, is a privilege, and Graham Chaplin told us in great detail how the work began, the making, the colouring and the eventual placing of the angel. The angel began life as the head appeared, a rough scale drawing on the forge floor and then on a board using chalk. He followed the wing layout of the reconstructed angel above the inside of the south door of the church, "then added restricted amounts of artistry. Her dress was forged from flat bars to create pleats, followed by forging quarter-inch plate steel to form strong-shaped back and front breast sections." The feathers were made next and welded together to form wings. Once welded to the back they were strengthened, "conscious of high wind loads due to the sail area of the wings". The head was repousse, forged from the back, "a tremendous amount of time here to gain an expression of kindness, yet a saintly feel". The hair was forged from long tapering sections, curled and forged to shape individually after fixing each one to the head. After that the heraldic shield was fixed to her breast, then the arms and hands to hold it. The shield at her feet "took a great deal of forging and fire-welding to match the existing bosses at the feet of the angels in the roof of the church. Fire-welding is white-hot metal beaten together to form one piece." The selection of colours was chosen for her wings and dress "in order to obtain a warm glow. Paints were applied wet on wet to allow blending using spraying methods to prevent hard edges. Rachel Alien carried out most of the artistry along with the hand-painting of the shields. She had been working at my forge on a part-time basis whilst studying for a fine arts degree." Graham Chaplin scaled the completed angel, her height and width, in relation to the viewer's angle from below. "She needed to be high enough to provide the feeling of glory but low enough to be seen, yet untouchable in the psychological sense." I asked him about his feelings now, with the angel in place, and he admitted to "a sensation of pride, looking close to the original vision, aloof yet kind, mysterious yet elegant, proud and approachable; very pleasing indeed". Difficulties that he surmounted had to do with "hiding escape holes for the hot-dip galvanising and allowing for air vents to prevent her filling up with zinc and weighing half a ton. This proved the most difficult, given that nothing of it can now be seen." 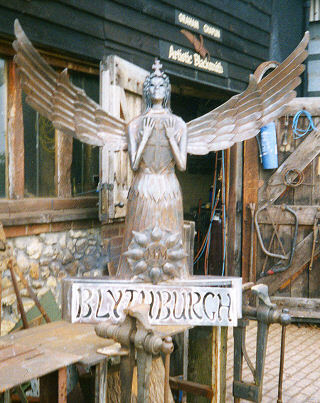 Let the artist have the final word about the Blythburgh Angel. "As any artist sculptor will know, one gets very attached to work such as this. It becomes part of you. I feel the same about all my work if given the chance to create a thing with meaning, elegance or power, or all of these things, and I could not help being totally absorbed in the search for perfection. All artists experience this great pleasure. It is unsurpassable." The angel was unveiled by the oldest resident, Miss Ena Collis, now deceased, and by the youngest resident, Matthew Doran, eighteen months, in front of a good crowd. It was blessed by David Alderton, a reader in the Sole Bay team ministry. Wine and cake were enjoyed under an awning as rain began to fall and the angel looked out over her new domain for the first time. Now more and more visitors are discovering our wonderful angel. She makes a good starting or stopping point in a walk round Blythburgh, taking in the White Hart, the old railway and old station yard, Angel Marsh, the bridleways back to Angel Lane and over to the A12, then across this busy bisecting road and down to the old railway again, the angel, and the Cathedral of the Marshes. For a picnic and/or a swim at high tide, why not walk down Appleton Lane, the sunken lane at the north side of the churchyard, and down to the River Blyth. From there you can walk by the river and back to the car park in the old station yard opposite the White Hart, a perfectly angelic way to end a visit to Blythburgh. Angel Lane (B1125); Old Angel Lane, leading to Angel Field (both privately owned); Angel Marsh lies beyond the field; and angels fly from the roof of Holy Trinity Church. They also appear in the following poems and the guide book of the church: "An Angel in Blythburgh Church", Peter Porter; "At Her Funeral", "A Lost Angel, Blythburgh", and "Iron Angel" by Richard Maslen; "Fallen Angel" by Wyn Parkinson; and The Guide Book for Holy Trimly, the Cathedral of the Marshes. The Blythburgh Society can be found on the web at www.blythburgh.net/history. Graham Chaplin works at Ironoak Forge for more details see his website: www.ironoakforge.co.uk.